The scale and intensity of thermal images can be controlled by software analysis tools (Figure 2A), and thermal images can be compared to abdominal radiographs (Figure 2B). Thermal imaging has come leaps and bounds since it’s early days. As you may know here at Bayswater we have been using thermal imaging for assessment and diagnostic purposes. We have discovered sources of back pain such as bulging/herniated discs, identified specific tendinitis, and uncovered anomalies in breast tissue such as cancer and non-malignant fibroids. Thermal imaging is a simple non- invasive procedure that takes approximately 1/2 hour to complete a full body scan. Having a thermal image of your body, even when feeling healthy, can provide a fingerprint of your natural thermal image, that we can refer back to in times of unknown aches and pains. As with other scans such as mammograms, a thermal scan each year or two can identify any possible physiological changes that may be occurring unbeknown to us. Having a great interest in thermography I came across an interesting article on how thermal imaging (Thermography) is being used for premature babies in hospitals. Using the same capturing camera as we use in our office, thermal imaging is helping save lives. The primary aim of this study was to examine the feasibility of thermography for the assessment of abdominal skin temperature in extremely low birthweight (ELBW) infants, with secondary aims to compare abdominal and thoracic skin temperature, and to explore potential relationships between abdominal skin temperature and necrotizing enterocolitis (NEC). The results found that infrared thermal imaging is feasible in ELBW infants. 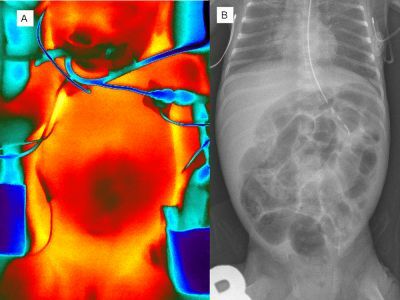 Thermography may be helpful for the study of thermoregulation in ELBW infants and may provide new insight into the role of regional perfusion in NEC. For more details of the study click here. At the moment I am the only therapist using this technology in our office. Please talk to me if you have any questions regarding thermal imaging. And if you are considering thermal imaging please give me lots of notice as these days I seem to be extremely busy. You may also want to have a look at these articles.